Technology makes it easier for doctors to remove tumors without invasive surgery or ionizing radiation. Microwave ablation may also be a viable option for people who can’t handle any more surgeries or chemotherapy. The biggest benefit of microwave ablation is that it is an alternative that may enable patients to avoid surgery. Recovery time decreases, and the complication rate also theoretically decreases because the risk of bleeding is less since no major surgery is involved. For example, renal tumors often require partial or total removal of the kidney. Doctors would typically take a biopsy, and then decide how much of the kidney to remove in a separate surgery procedure. In cases where surgery is unavoidable, using the same microwave ablation technology, your physician can essentially shrink (debulk) a large tumor before removing it. This can increase the likelihood that all the tumor will be removed during the surgical procedure. In MedWaves’ applications, the “material” is soft tissue. Microwave ablation is a precise medical procedure. 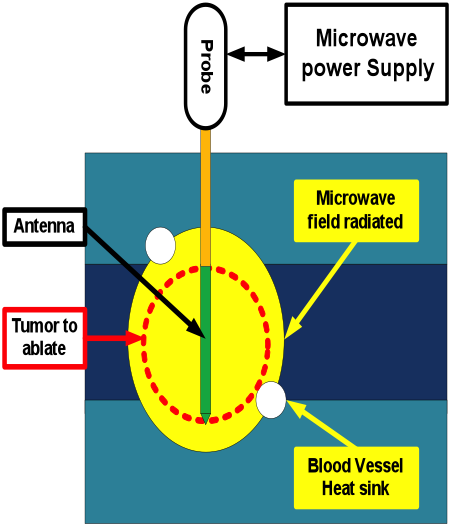 The doctor inserts a microwave antenna designed to ablate a specific amount of tissue at the end of a needle-like device into the target using an imaging guidance system such as ultrasound or computer tomography. Once the antenna is embedded in position and verified, programmed dosage of energy is delivered from a microwave generator to produce an amount of destruction needed to cover the lesion. If the amount to be destroyed is greater than possible with single positioning of the antenna, it can be repositioned and energy reapplied as necessary to produce larger overlapping ablation zones, or may simultaneously use multiple probes to shorten the procedure. During the energy delivery, a built-in temperature sensor near the antenna provides feedback to the generator to control the energy. This prevents the ablation zone from reaching excessive heat levels and runaway temperatures that could cause collateral damage. The microwave energy field directly destroys tissues and produces temperatures above 60°C, which causes instant cell death. The destroyed and dead tissues are absorbed into normal body waste, and small scar tissues may remain. Microwave ablation provides a safe, effective and minimally invasive treatment technique, an alter­native for those patients who are not candidates for surgery. 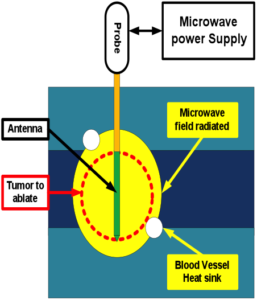 How is Microwave Ablation Used? Microwave ablation can be used in the three treatment techniques described below. However, you should consult with your doctor to determine which is best for you based on size, number, location and severity of your condition. One or more needle-sized antennas are passed directly through the skin and guided into place. This usually requires light sedation, but the doctor may opt for general anesthesia to produce the best result. You can usually go home the same day or next day. This usually produces tiny, almost invisible scars. Several tiny incisions are made, allowing the insertion of microwave antenna and imaging probes. This requires general anesthesia. You can usually go home the next day. It produces small to tiny scars. Ablation is performed during surgery, allowing the doctor to view the tumor before, during and after treatment. Usually intra-operative imaging ultrasound is used to position the antenna and monitor the ablation process. General anesthesia and several days of hospital stay are required. This produces the largest scars. Immediate reduction of the size and elimination of the tumor. Minimally invasive – usually done on an outpatient basis. Highly effective – can be used to tackle large tumors. It can be used repeatedly for recurring or new tumors. Very few complications or side effects. Low-grade fever for a few days following the procedure. Very low risk of skin burns, bleeding, fluid accumulation, injury to adjacent structures and infection. Microwave ablation can be used alone or in combination with another cancer treatment to bring about more effective results. Treatment of choice depends on the size, location, number and severity of the disease, and your general health. Your doctor will help you decide if microwave ablation is a good option for you.